Last month, a felony of the deadliest kind went down at Buru Buru, leading to the death of one person and consequently the end of a relationship. The life belonged to 24 year old Farid Mohammed who succumbed to back, chest, neck and stomach injuries after getting stabbed 22 times by his girlfriend. 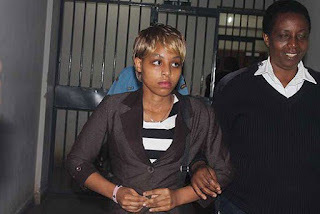 Ruth Wanjiku Kamende alias Biggy was the perpetrator who had a bright life ahead of her, but lost her freedom and could possibly spend life in prison after killing Farid once she allegedly found a love text on his phone. The 21 year old woman was in court on Tuesday where she was charged with the murder of Farid but did not plead to the charge as she had no lawyer. 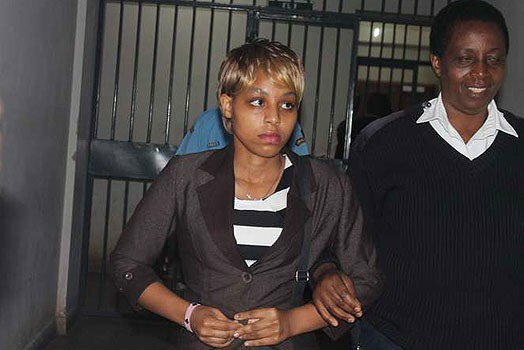 Earlier on, Ruth had been handcuffed to a bed in Kenyatta National Hospital nursing wounds on her stomach, right thigh and left hand that she sustained during her scuffle with Mohammed.